Ecuador Living is more than living in Ecuador. 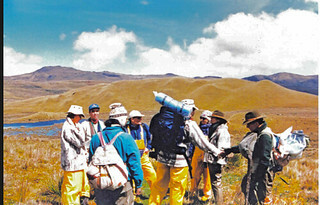 Ecuador Living is a lifestyle of prosperity and good health based on ancient principles united with modern technology. Ecuador Living can be lived on the equator, in the USA or wherever you are. 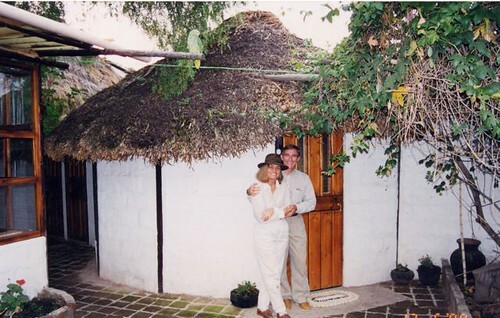 Gary & Merri Scott at their home in a shamanic village. Learn how to combine modern ideas with ancient wisdom for everlasting wealth, better health, less stress and a lifetsyle that is fulfilled. A bite of chilled wind swept the broad Andean marsh where diamond sunrays sparkled and danced on a frying pan lake below. Damp odors of ooze, mud and grass were mixed in harmony to the taste of my blood, my senses concocting strange mixtures in the altitude-thinned air. High on a mountain slope overlooking the LLanganatis Valley, the sun filled the Amazonian Valley below. Who was to know that the discovery of one of South America’s most ancient secrets for vitality and good health lay just ahead? Breathing heavily in the 14,000’ rarified air, we rethought how this trip has evolved. 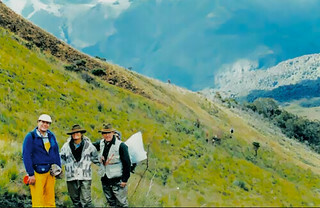 My wife, Merri, and I, along with two medical doctors (who specialize in anti aging) and friends, walked toward a sacred valley where western man had never been invited before. This was an unusual beginning for a couple who had devoted their efforts to the hard facts of making money with international business and investing. 46 years ago I began a business, speaking and writing about international investing. This led me (and later my wife Merri) from helping readers find and invest in real estate and other investments in Hong Kong, to London, to the Isle of Man, then the Dominican Republic and finally in the mid 1990s to Ecuador. While working in the Andes, along Ecuador’s Pacific coast and Amazon, we helped thousands of readers explore and invest in this amazing country. We also met some very special men who were from long lineages of healers. They received such intensive training they became Taita Yatchaks, Father of Fathers-healers of great purity. 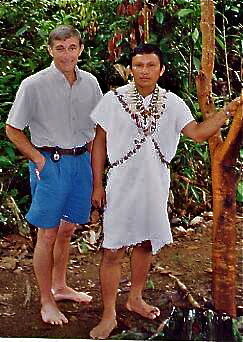 Gary Scott with a shaman in the Amazon. We became involved in creating a foundation to help the indigenous of Ecuador and because of this the Taita Yatchaks asked us to help them fulfill a task to bring secrets from the South to the North and to bring important knowledge from the North to the South. The Yatchaks told us there was a 500 year old prophesy that states when the Eagle of the North and the Condor of the South flew in the skies together, a greater equilibrium would exist for mankind. People of the north live too much in their brain. People of the equator live too much with their hearts. When we integrate our intuition and our logic we become wiser, more intellgient and take on expanded horizons. The quest of the yatchaks is to help accelerate the evolution of man’s intellect. They asked if we could help fulfill this prophesy. To be part of a prophesy unveiled five hundred years ago is humbling at the least. Scary is probably a better word. Yet we felt compelled to accept and so with several friends, we started helping these healers meet people from the North, not knowing the best was yet to come. 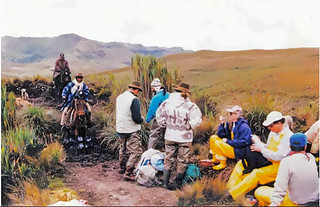 Gary and Merri Scott taking group to ancient Inca ruins in Ecuador. The Yatchaks explained there was a sacred preserved valley where no man was allowed to live and where no westerner or outsider had ever been invited. The Yatchaks were protectors and kept it carefully guarded. Part of their prophesy was when the time was right they would take a westerner to open secrets from this valley to the rest of the world. We were told that our efforts to help them were signals that we should go into the valley. We had no idea then how special this valley was. Only later did we learn that even in colonial times the Spanish knew of it and believed that the valley contained the fountain of youth. The valley is considered to be a spiritual rejuvenation. This valley was also said to contain a hidden treasure of the assassinated Incan emperor, Atahaulpa. The Spanish had tried to find this valley but the natives would not reveal its location. Hundreds accepted enslavement, torture and even death, rather than disclose its secrets. This was to be the first time these protectors had ever taken an outsider into the valley. We did not know this when Merri and I arrived with several friends including Jay Glaser and his wife Danielle and another medical doctor who also was studying longevity. This was a good thing because our arrival was with a sense of foreboding. We felt almost frightened rather than thrilled. Several villages held a special meeting of the protectors to perform a rite of permission. Gary and Merri Scott after a purifying bath in the sacred spring before beginning the journey. Only then did we discover that even native Ecuadorians had never been allowed to know the location of this valley. 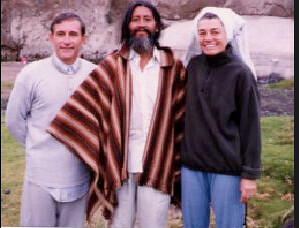 Only the healers and spiritual leaders of the Andes went there. The other M.D. researching longevity traveled with us but rather than visit the valley visited another valley where there are healing thermal pools. While there he told the owner of the hotel where we were going and was told we would never ever be seen again alive! The owner told our friend he (as a young man) had once tried sneaking into the valley, had been caught, stripped naked, hogtied and dumped on a lonely road. The man’s effects had all been dumped in a bundle at the hotel with a note saying where to find him with a warning of the dire consequences to anyone who tried to go in the valley. Merri, Danielle, Jay and I didn’t know this as we headed into the valley. We started our journey at 4:30 a.m. riding up into the mountains to a hiking point with six llamas that carried our food, two young boys to herd the llamas, a cook, a Taita Yatchak and his son and daughter. We began hiking at about 10,500 feet, tramping through deep Alpine marsh for six hours as we ascended to 14,000 feet. Here we drank from a spring that formed part of the head waters of the Amazon Basin and then descended straight down (4,000′) on a hidden mud animal trail for three hours into a virtually impenetrable cloud forest, ripped by thorns, cut by razor grass, soaked, and caked in mud. Then we moved down into a dense jungle. Here is Merri and me in the thick of it with the Taita Yatchak. By the time we arrived in the valley, it was just minutes before dark. We were fatigued more than I can describe, by the high altitude, bone weary from our heavy packs, every muscle aching from fighting all day, in the altitude thinned air, the sucking mud (which had regularly pulled off our boots). We stayed in a floorless, leaky thatch hut, sleeping on dirt, no heat except the cooking fire, no running water, nothing. We were continually cold, wet, dirty and cramped-all 12 of us in this tiny hut with its earthen floor. The next morning, to our surprise we all felt wonderful! We had no aches, no pains and each of us looked glowing and wonderful. We explored the valley which is perpetually wrapped in mist and fog. We swam in small icy, deep blue lagoons and did ancient exercises while the Taita Yatchak talked with us about longevity and health. None of us had ever had so much fun! There is something about the valley that one cannot explain, an abounding energy and peacefulness. Even at times when we were really worried about some of the party who had gone into shock from fatigue, there was never a moment of regret. We discovered a magical quality to this Sacred Valley and after our return found powerful emotional and physical evolutions happening to all of us. Merri and I, along with the others, felt physically stronger, more alert, more positive, more active and yet more serene than ever before in our lives. This feeling of well-being was physical as well as emotional. We found that though our stay had been short we lost weight, increased muscle mass and were stronger, more balanced and our bodies and mental state felt better in almost every way. This is the magic of the Andes. Yes there is opportunity in low cost living, property, business, import and export. The weather is glorious and the people sweet. Blend them all together in a tangle of Incan history and beyond. 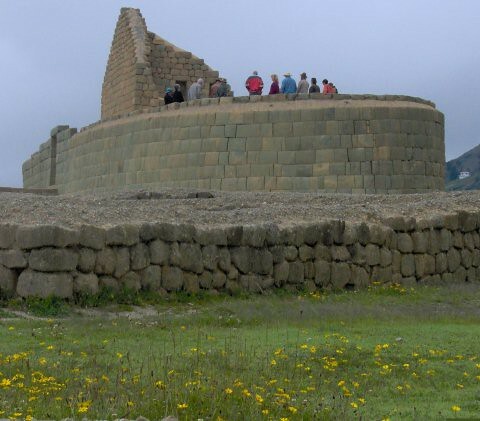 These are all small parts of the magic of Ecuador, but the real magic is merging the spirit of the condor, the most powerful intelligence we have, our intuition, with our logic. 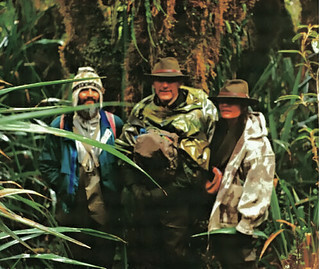 Gary and Merri Scott promoted dozens of Ecuador shamanic tours. 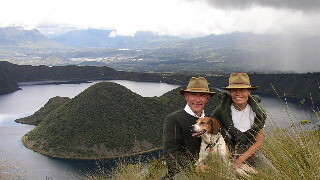 Gary and Merri Scott conducting an Ecuador real estate tour. When your heart and brain work together you gain the magical quality called Ecuador Living. We brought thousands of readers to the Andes and we brought yatchaks to the USA. Now we share the experiences gained from our 46 years of global business and investing merged with the wisdom of the Andes. 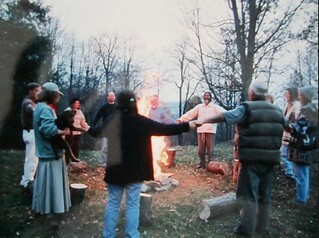 Gary and Merri Scott with Yatchak conducting purifying ceremony at the Scott’s North Carolina Farm. You can live better in this era of cynicism. Most readers who joined us in Ecuador were cynical about what’s going on where they live. Inflation, recession, rigged investment markets, ridiculous insurance and health costs, weakened pensions, unprincipled banks and big business supported by corrupt government and rotten politics. What’s not to be skeptical about? Most readers sign up to our website because they want a lower cost of living, affordable health care, more freedom, better food and new exciting adventures. They are fed up with what has happened at home. Now you can gain from the deep knowledge given to Merri and me by the Andean Taita Yatchaks who shared the 500 year old prophesy. Living with the yatchaks for years certainly taught us a lot about how to gain in living, health, wealth, business, investing and all walks of life by uniting the heart and the brain, logic and intuition, so you become wiser, happier, healthier and think more clearly in ways that create everlasting wealth. Let’s face it, we need to be smarter and skeptical in a world when every business seems to have a trick, filled with small print and fast words that DO NOT protect us. Governments and business really learned from George Orwell how to Double Think and Double Talk. Downsizing means layoffs. Affordable Health Care does not mean that at all and the tax simplification act has allowed the tax code to go from 26,300 pages to more than 70,000 pages. In the last decade alone, there have been more than 4,400 changes to the code – more than one a day. We cannot stop the change. The fates of nations are never steady. Every country has its ups and downs. We can have a calm, Ecuadorian lifestyle that promotes natural good health and reaps wealth despite economic chaos and social turmoil. The wisdoms of the Andes helps create a carefree lifestyle even in the darkest hours. For example Merri and I were living with a yatchak at our remote Andean hacienda, Rosaspamba, when Ecuador’s economy shut down in 2000. View from our front yard at Rosaspamba. Gas ran out though out the country. All Ecuador banks closed. The yatchak lost every penny he had. Upon learning this, he called for a Mingo (meaning a circular meeting) where he performed a ceremony of thanks for all the change that these losses would bring. Changes in the Yatcak’s financial life did not rob him of a penny’s worth of living. Nor did the loss divert him from his purpose and his missions in life. There was plenty of reason to be thankful as well, both in the Yatcak’s intuitive mind and in our logical northern businesslike way. The economic disaster of 2000 started an expat inflow of epic proportions and brought wealth to Ecuadorians that had never been seen before. Ecuador real estate prices skyrocketed. New jobs were created based on tourism, construction and expat living. Unimaginable wealth flowed into Ecuador as the country moved from being a Stage I to Stage III developing nation. 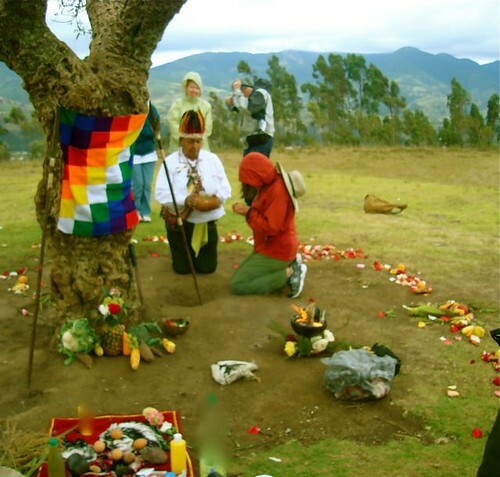 Ecuador Living shares ideas on how to combine ancient Andean wisdom with western logical ideas for investing, earning and natural health. From that moment, we united Super Thinking ideas created by Ecuador living into our www.Garyascott.com website so you can gain the latest ideas on how to survive and prosper in the era of cynicism with Ecuador Living. 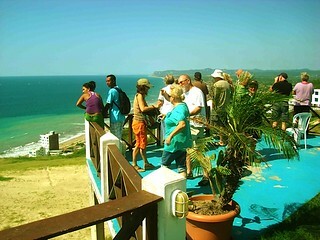 You can learn all about Ecuador, real estate for sale, how to get visas and low cost prescriptions and medical care. You can find ourt how to rent, and buy real estate, how to create exports businesses and multi dimensional Ecuador businesses, plus have low cost Ecuador health insurance and import pets. You can gain contacts, lawyers, hotel owners, expats, businessmen, doctors, dentists, travel agents and more. The biggest benefit you gain from Ecuador Living is super thinking. You don’t even have to board a plane to learn how to add the wisdom of the Andes for improved health and everlasting wealth.